Yocto does one thing and it does it well – it helps you to create a simple, minimal and elegant blog with no hassles. We are delivering you a beautiful, handcrafted, well-optimised theme that contains no bloated code and unused features. Just the way you need it to be able to focus on creating your extraordinary content. 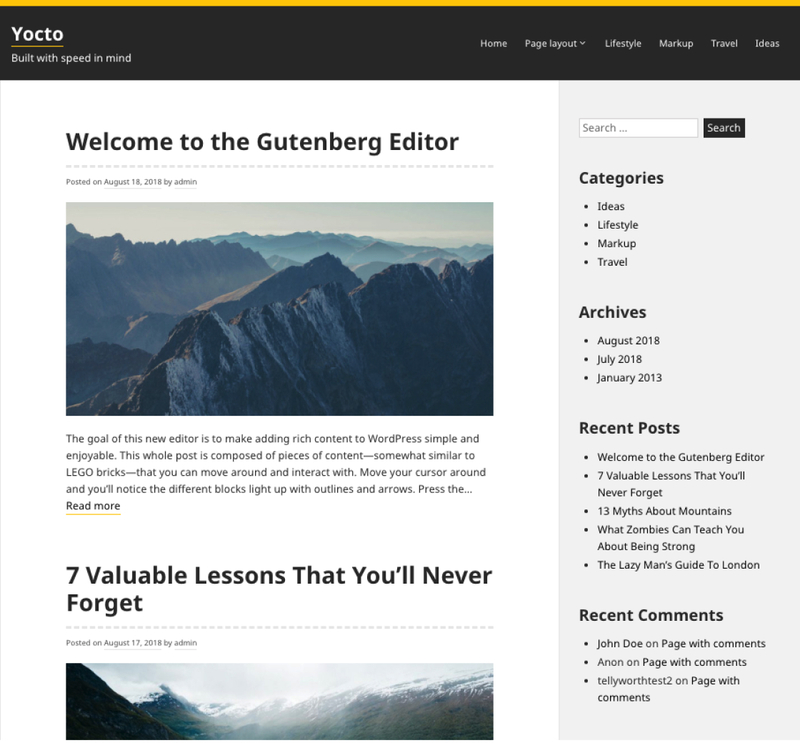 Gutenberg is the new WordPress block editor that will be shipped with WordPress 5.0. It’s really going to be a game changer and it will make adding rich content smooth and simple. We aim to always be one step ahead of others and that’s why Yocto already has Gutenberg support baked in. What can be more exciting than that? Did you know that approximately 18-20% of your visitors rely on inclusive web and accessibility to be able to use your site? That’s why Yocto is handcrafted with real people in mind. Accessible means easier to use, clearer to navigate, good for everyone. Accessible theme results in increased audience and effectiveness. All that just because we know that your readers are extremely important and you care about them. Yocto is SEO friendly right from the beginning. It provides you with Semantic HTML, correct headings and page structure and fast loading times. All you need to boost your rankings. There’s only one thing we didn’t cover – high-quality content, but we know that you will handle it perfectly. We take security very seriously. We’re making every effort to keep our code base up to date with WordPress coding standards as well as we are pushing regular updates to the Yocto theme itself. We want to provide you with the quality you can trust. Yocto comes with included .POT file that allows you to translate it into any language of your choice. That’s a no-brainer for us. Wheather you are stuck with a problem, found a bug or simply have a question: Our professional support team is always there for you. It’s important for us so you know that you can reach for help anytime you need. And we mean it.